“Lawyer for the Dog,” by Lee Robinson. Thomas Dunne Books/St. Martin’s Press, $24.99. 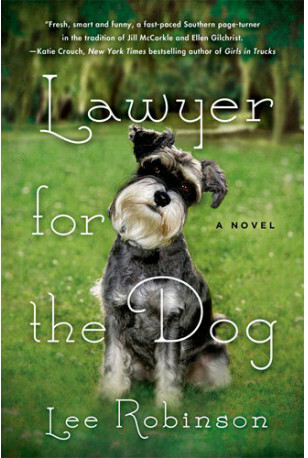 It wasn’t exactly the ending I envisioned, but this fun-filled Southern-based novel is a clever and amusing portrayal of a middle-aged attorney Sarah Baynard and Sherman, a miniature schnauzer that suddenly becomes the conduit for every relationship in her life. The author, who practiced law for more than 20 years in Charleston, S.C., the site of the action here, develops the central characters skillfully and with plenty of persona. Some tantalize, some teeter, always with psychological gymnastics. The book centers around Baynard’s former husband, Joe, a judge, asking her to do him a favor and serve as Sherman’s guardian ad litem in a hotly contested divorce case between a wealthy long-married man and woman who are odds as to who should get custody of their beloved dog. This is new turf for Baynard, a public defender and family lawyer who has represented murderers, burglars and drug dealers. Add to that she doesn’t own a dog and has no desire to, since her plate is full caring for her elderly mother suffering from Alzheimer’s and a crowded load of cases. Accepting this challenge means Baynard must query both the husband and wife in regard to each’s relationship with Sherman and why he/she should retain custody going forward. Add to that the others she must interview before eventually making a recommendation on Sherman’s behalf. This prompts new pathways, a colorful mosaic of characters and even a budding relationship for Baynard with Sherman’s veterinarian. Throughout the procedure, Baynard takes possession of Sherman and a somewhat predictable bond begins emerging between the two. As the story flows breezily down the homestretch amidst plenty of brief punchy slices of life, I had a preconceived idea of how Robinson had it finishing. Didn’t happen. “Lawyer for the Dog” is smart and frothy, soberly reflective and packed with spirited realism amidst a carnival of characters.